We just got back from a two week mission trip to Nicaragua in which I also had the opportunity to borrow a bike and win a bike race (see podium picture above). 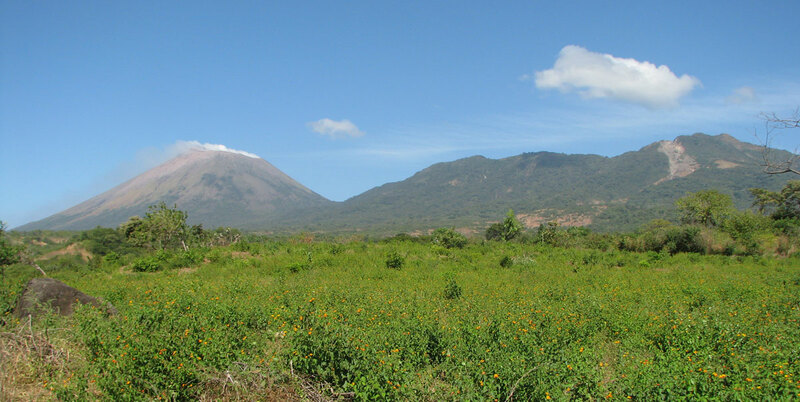 I also bought a used mountain bike for $40 that I managed to ride nearly 100 miles in the León, Nicaragua area (see the volcano and bike shop pictures above). The Birmingham Bike League is coming down to the final three weeks, and I have been helping organize the rides by maintaining the website. I am also doing pretty well in the series sitting in 3rd right now hoping to move up into first sometime in the next week or two. I have been busy with my “day job” at Samford University, and I am excited about the upcoming semester which starts tomorrow. I have a few research projects related to cycling that I am hoping to be able to work on in between classes. I am teaching senior seminar this semester so I may be able to convince one of my seniors to work on a bike-related project, too! This entry was posted in Training and tagged photos on January 25, 2009 by kartoone. 5. 8:40 Arrive at Rotunda La Virgin, disembark from the taxi, and look for Shannon O’Reilley the presidente of the Nicaraguan Cycling association. I find him and introduce myself and he shows me his shiny silver Scott bike that I will be using. I then meet Fernando who speaks a little english and is the national road and mountain bike champion of Nicaragua. He will be my teammate in the race. Then we go to get my bike setup to fit me. Then we go for a ride on the course while the other races are going on – we just pull over towards the side when they come by. For the race today, I borrowed a bike and shoes from Shannon OReilley, the president of the Nicaraguan Cycling Assocation. The race was a 1.25 km course with two 180 degree turns. The start/finish was at the top of a downhill which took you shortly into the first 180 which was a VERY large roundabout called “Rotunda La Virgin” complete with a statue of the Virgin Mary and for the Christmas season all kinds of camels, sheep, and wise men. The roundabout itself was probably 1/10th of a mile or more. When you exited the roundabout you came back up the start/finish hill but on the other side of the road. The hill wasn’t that steep but it was into a strong headwind (20mph?) so that going super hard across the top you were only going 16-18 mph. Then you went into this headwind all the way to second 180 degree turn which was a normal 180 (not a roundabout) so it was pretty sharp. Then you had a 20mph tailwind and we easily were topping 35mph through here on the first couple laps. Two riders on different teams attacked on the first lap, and my teammate, Walter, joined them to form a small three man breakaway. They got a little bit of a gap, but the pace was just way too fast on the downwind part of the course. We caught them at the start of the second lap. My other teammate (the national road and mountain bike champ) attacked on the hill and got away solo but another rider bridged to him and then again because of the tailwind we caught them both at the start of the third lap. So for the first two laps, the pace had been super fast when we started the third lap and made it around the roundabout starting up the hill into the headwind. I attacked as hard as I could thinking that people would be tired and I at least wanted to put on a show as the token “gringo” in the race. I had a 20 second lead for the next 7 or 8 laps but then I could tell my gap was shrinking. It was awesome to hear everyone on the side yelling “allez”, “allez”, “allez”, and one boy yelling “allez gringo, allez gringo”. I knew that I wasn’t going to be able to stay away from the chase group behind me which included one of my teammates (Walter) who had bridged from the third group to the chase group so I eased up and then there were four of us off the front. We used our numbers perfectly with Walter attacking first and forcing the strongest sprinter in the race to chase. I hopped onto his wheel and when Walter was reeled back in, I launched a counter attack and only the Shell rider could follow. So the two of us got away and worked together with me pulling up the hill into the headwind and the Shell rider pulling on the tailwind section. We worked together for the last five laps and then I was able to outsprint him. 7. Wow – what an opportunity – thank you so much Shannon for loaning me your bike and helping me have this opportunity to experience cycling in Nicaragua. Thank you Raly USA teammates – Walter, Fernando, and Allan! 8. I was impressed with how many “jovenes” youth were racing today. 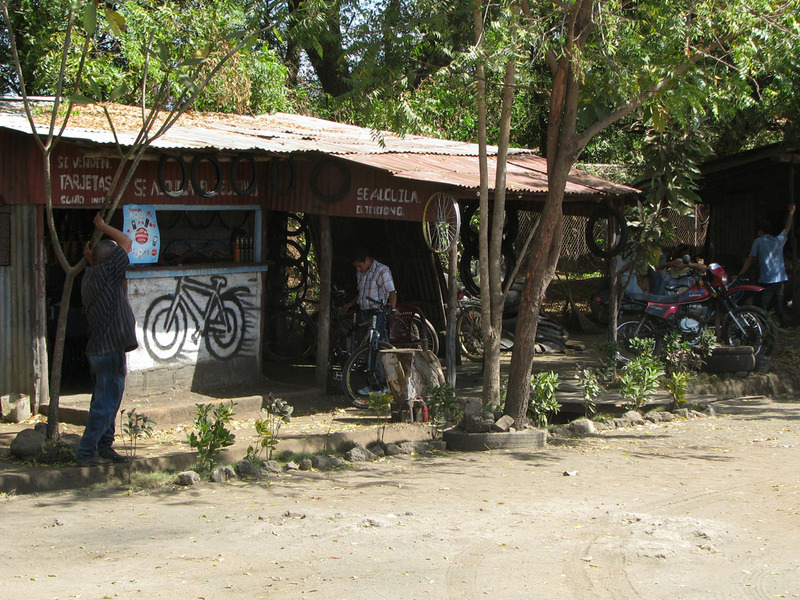 That’s a good sign for the future of cycling in Nicaragua! Hopefully, I will be back to race again and maybe next time I can bring some of my teammates from the USA. 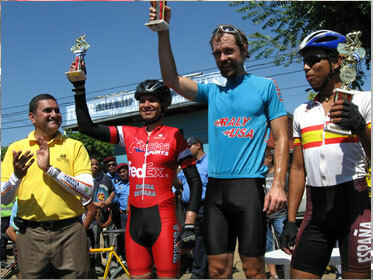 This entry was posted in Racing and tagged criterium, nicaragua on January 4, 2009 by kartoone.